In small bowl, mix preserves, vinegar and pepper flakes; set aside. Pat shrimp dry with paper towels. In shallow dish, mix Bisquick mix, red pepper, milk and egg with fork until well blended. In another shallow dish, place coconut. In 12-inch skillet, heat 1/4 inch oil over medium heat. Working with half of the shrimp at a time, dip each shrimp into egg mixture, shaking off excess batter; lightly toss in coconut. Place in hot oil in single layer; cook 3 to 4 minutes, turning once, until coating is crisp and golden brown, and shrimp are pink. Serve with apricot sauce. Serve these shrimp for lunch over baby salad greens. 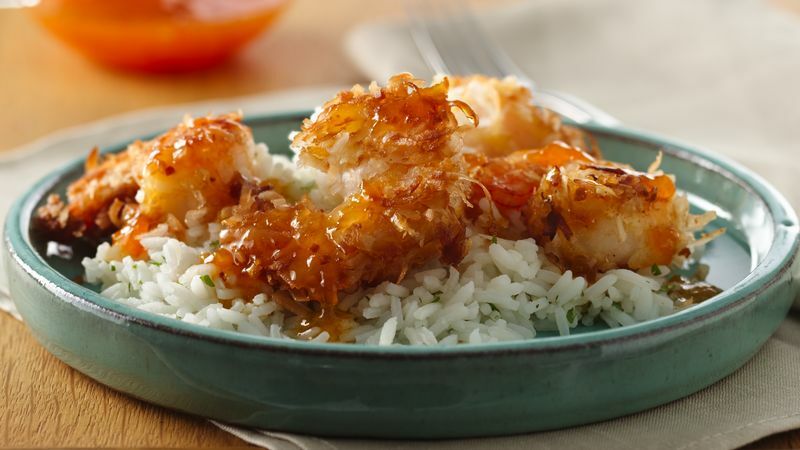 Drizzle the apricot sauce over the shrimp as a dressing.